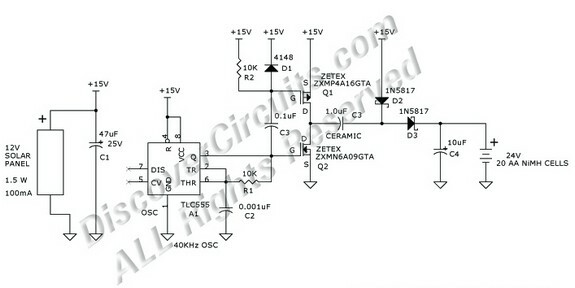 Circuit schematic like in Figure 1 above is Circuit Schematic 24v NiMH Battery Charger Using a 12v Solar Panel Based on 555 IC. According Discovercircuit site describe that There are lots of low power 12v solar panels available but fewer 24v panels. A typical example of such a panel is shown above. These devices are often mounted on the inside of a car’s wind shield and with the aid of a cigarette lighter adapter, can keep the car’s 12v battery charged. This is handy when the car is parked at say an airport lot for weeks or even months at a time. Many car manufactures also use these things to keep the battery charged when the car might be at a loading dock for long periods. The typical panel has 32 solar cells. This kind of panel typically cranks out 1.5 watts to 5 watts with an open voltage of about 18v and about 15v under load. In the typical mode, the panel pumps a constant current into the battery. Normally, a diode is placed between the panel output and the 12v battery to prevent current from leaking back into the panel from the battery at night. The low current from the solar panel during daylight hours is not enough to harm the massive car battery, which usually has an Amp-hour capacity about a hundred times higher the charge current from the solar panel. Solar panels are expensive so using just one panel with a voltage boost circuit would cost a lot less than the cost of two panels. A battery pack consisting of 20 AA size NiMH cells will produce a nice 24 volts. But, most NiMH cells require about 1.36 volts to achieve full charge. That means a voltage of about 27 volts would be needed to charge the pack of 20 cells. This voltage is much higher than available from the 12v solar panel. Fortunately there are lots of ways to boost the voltage. A switch mode type DC to DC converter could be used to take the lower voltage from the solar panel and pump current into the battery at a higher voltage. A voltage doubler circuit could also be used. The 100ma from the solar panel would be transformed into about 50ma into the battery pack. Figuring about 6 hours of sunlight each day, the circuit should be able to pump up to 9 watt-hours of energy into the battery. The guy in the UK said that the motor load required 2 Amps for 20 seconds, 4 times each day. Take 24 volts times 2 Amps and you get 48 watts. Multiply that by 80 seconds and you get 3840 watt-seconds. Divide this figure by 3600 and you get 1.07 watt-hours. So, the 1.5 watt solar panel, even if it received only 42 minutes of sunlight per day, would keep up with the energy demands of the window blind motor. Read more here.